germany | Another Beautiful Day in Paradise! I think like many people, I only partially understand the reasons the economy has gone down the toilet over the past three years. While I get the general idea behind the housing boom, loose credit and CDO’s, I still have trouble getting my mind around them. Lewis did a great job in “The Big Short” of telling the stories of some investors who anticipated the big bust of 2007-08 and profited greatly from their insight. Iceland, where everyone wanted to become an investment banker, whether they knew anything about investment banking or not. Greece, where the government created a massive entitlement state on borrowed money and with a population that doesn’t want to pay their taxes. Ireland, where the Irish took the free money and created their own housing bubble. And Germany, where the bankers pretty-much financed most of the other countries. He finishes up in California – another economy with a population that wants massive government services without having to pay taxes to pay for them. The best part of the book is Lewis’s writing style. 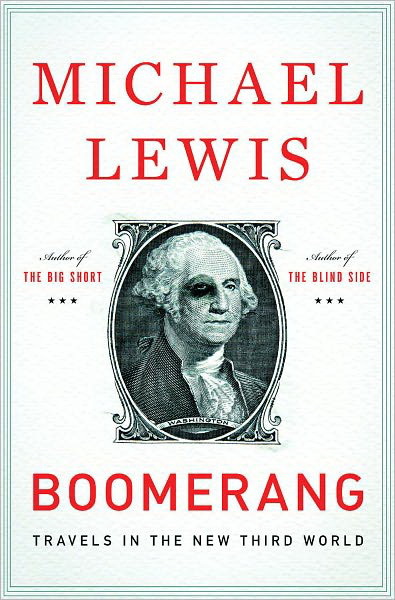 While “The Big Short” and “The Blind Side” were both serious, straight-to-the-point narrations, “Boomerang” is tongue-in-cheek to the point of being almost whimsical. He pokes some serious fun at the cultural tendencies of the people in all those countries. In every chapter, I found myself chuckling over his observations and analysis. I’m not sure anyone in the subject-countries would appreciate his sense of humor, but I sure did. “Boomerang” is fairly short, and you don’t need an MBA to understand it. If you are curious about what is happening right now in places like Greece and Italy, Lewis has some answers…and a few laughs too. After Friday night’s , Dan and I went light on breakfast Saturday morning. Besides, speaking for myself, I don’t think I could handle another sausage this soon. 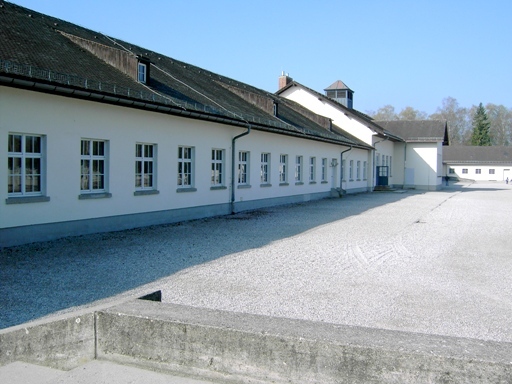 Our first stop was the Dachau concentration camp. I think we came out of it with mixed feelings. 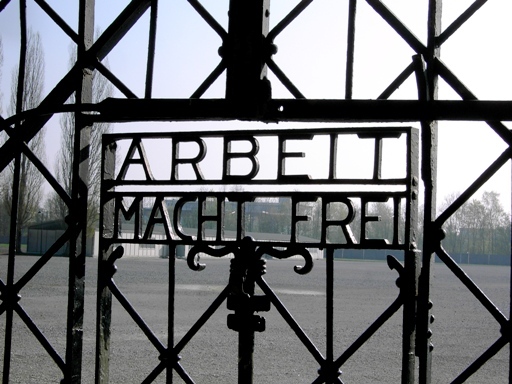 On one hand, it was a moving experience to walk on the actual site where so much evil was perpetrated. But on the other hand, the actual camp/memorial is fairly sterile. Much is simply a large open area of graveled ground. The museum is sparse. 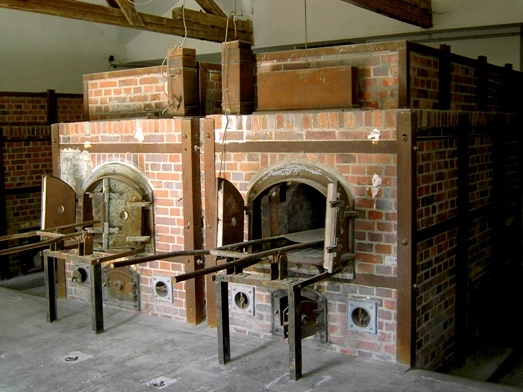 The execution and crematorium area is landscaped and well groomed. It is actually like a park. Maybe that is the idea. 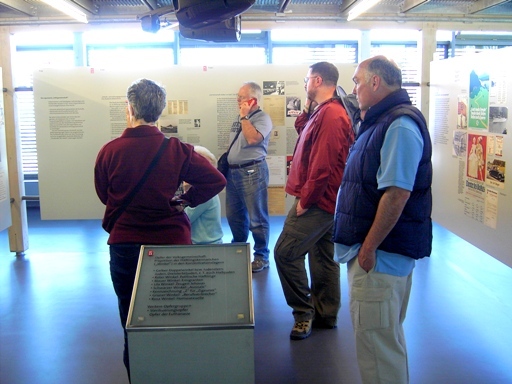 However, the sensory impact of Dachau contrasts sharply with some of the military museums, especially those with audio-video experiences, we visited last week. 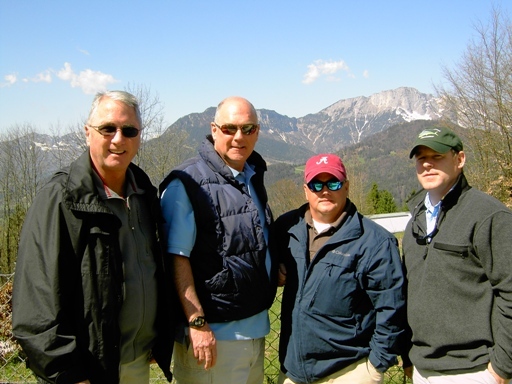 By 11 am, we were on the road again, heading to the Bavarian Alps. The trip was very scenic. Most of our trip was through a country of rolling hills and small villages. 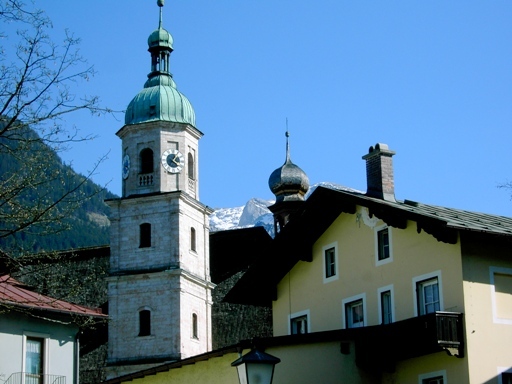 We drove through Berchtesgaden and then up the mountain to Oversalzburg, which is actually the village where all the Nazi bigwigs had homes. 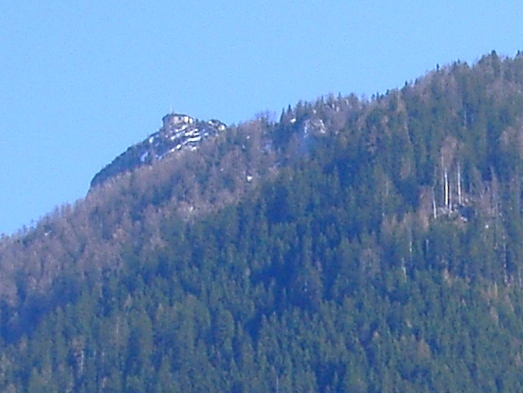 Hitler’s Eagle’s Nest was not accessible. Eagle's Nest is that little knob on the left of the photo. Apparently the special shuttle buses don’t run for another few weeks. 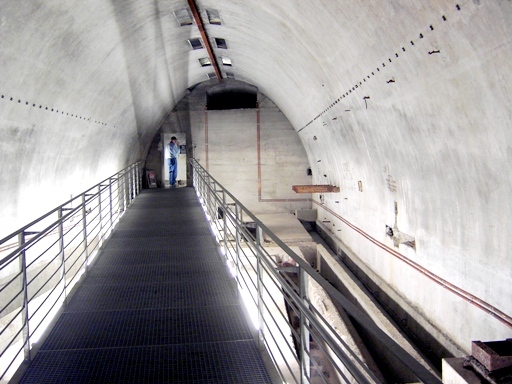 The restaurant was closed at the visitor’s center, but there was an interesting interpretive center, complete with Hitler’s underground bunker. 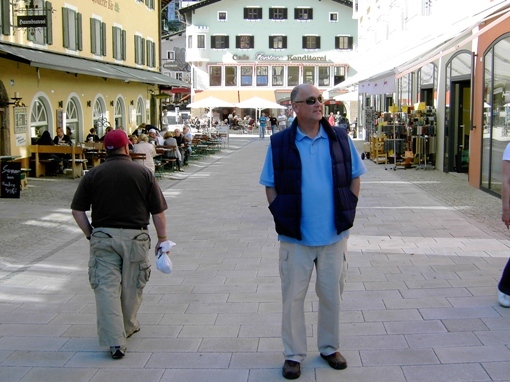 After a couple of hours at Obersalzburg, we stopped in Berchtesgaden. This is a pretty little resort town, but a bit on the touristy side. 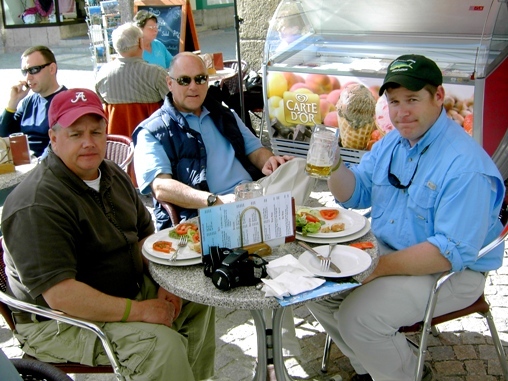 Birdie and Ron had a Berchtesgaden hot dog. 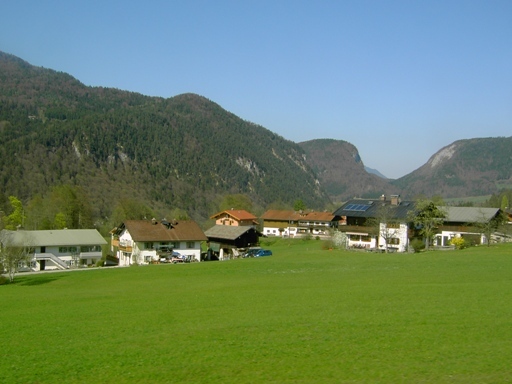 A Berchtesgaden scene. Note the Alps in the background. It has a bunch of cafés, boutique stores and gift shops. 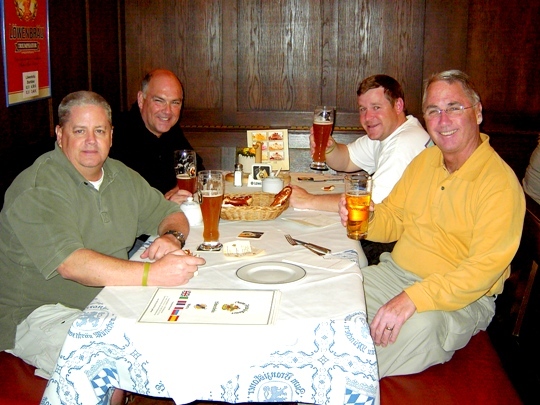 We headed back to Munich for our “farewell dinner” at the Hofbrau House, a famous, 400 year old beer hall. It was a fun time. 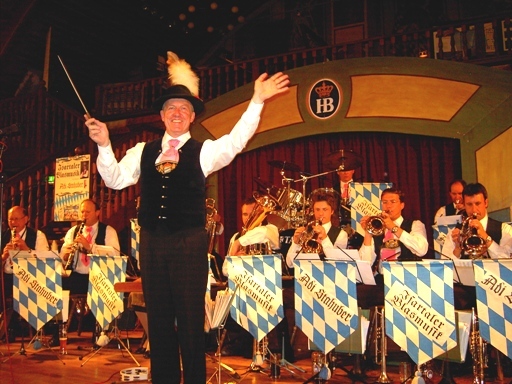 I think the band conductor has had plastic surgery to permantly put a smile on his face. We were entertained by a Bavarian band, dancers (who looked very bored) and some guys with whips who came out and snapped them in time with music. The hall was filled with hundreds of people at long tables. The beer came by the liter. We all had wienerschnitzel warn potato salad. Dan and Poolman. Note the liter size beers..
On Sunday morning, we were out of the hotel by 8 am. bound for Munich airport. That’s 2 am Savannah time. We didn’t land in Savannah, after three airline segments, until 9:30 pm. It was a long day. On the trans-Atlantic leg, I watched an episode of “The Big Bang Theory” and three movies. I got a good night sleep Sunday night and was back at work by late morning on Monday. It was a fun and interesting trip, but I’m glad to be home. Two weeks is a long time to be gone for me. In my entire life, I probably haven’t spent five minutes thinking about Luxembourg. Now I’ve spent the night there. If I had thought about it, I probably would have envisioned Luxembourg as a set of bucolic, rural villages with lots of haystacks, ox-driven carts and buxom milkmaids in apron dresses. Not the case. 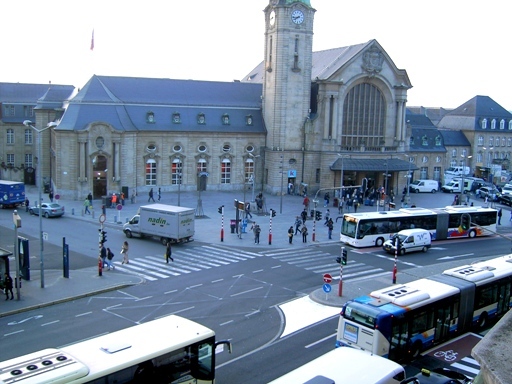 Luxembourg, at least Luxemborg City, is a bustling urban-commercial center, with serious central city traffic issues. 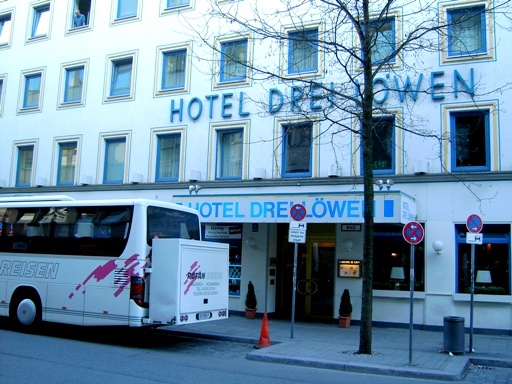 Our hotel was right across the street from the train station. Just getting the bus loaded with luggage and people was a challenge this morning. Our only history-related stop today was at the Luxembourg American Cemetery. 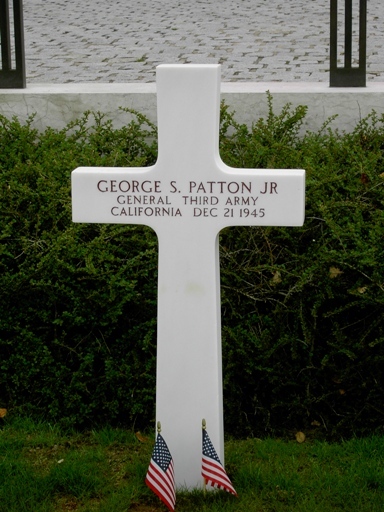 It’s most famous resident is General George Patton. Then we got back on the bus for the long haul to Munich. We arrived in Munich in the early evening. 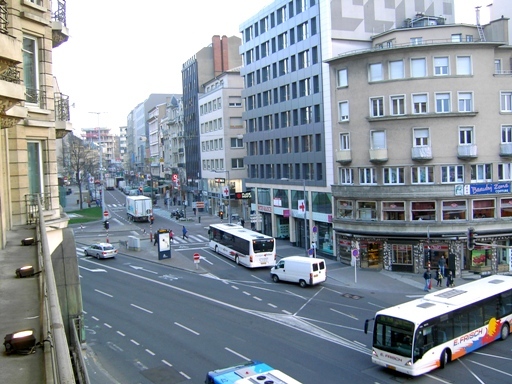 We got settled into our rooms and Dan, Birdie, Ron and I took off to the central part of the city. Our hotel is nice enough, but it looks like the neighborhood around it has gone downhill in recent years. We are only a block or two from the main train station, but our hotel is surrounded by strip clubs and mid-eastern gold buyers/sellers. Not the kind of place you go walking alone at night. 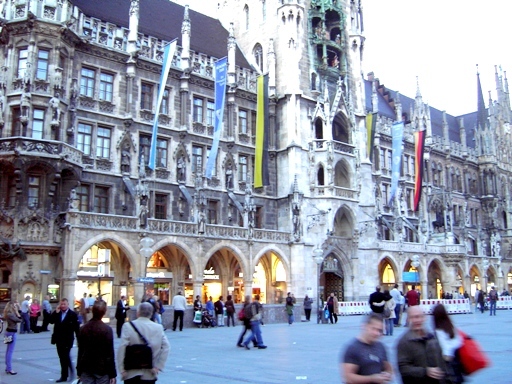 Somewhat surprisingly, within a couple of blocks, we were out of the rough section and into a wide pedestrian mall leading to the Marienplatz at the center of town. 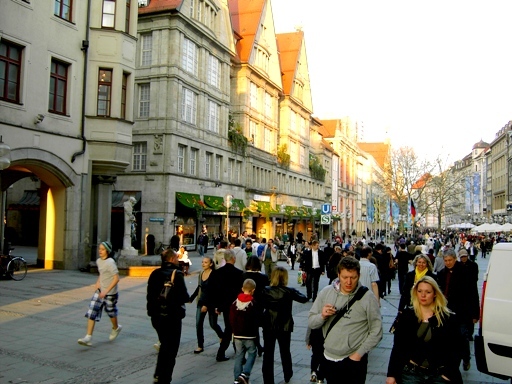 Part of Munich's central city area. Munich's City Hall with a Glockenspiel. We did not see it perform. 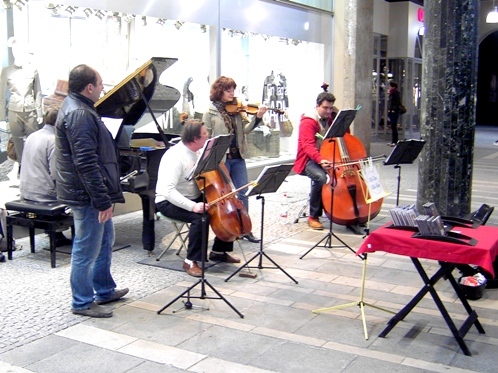 We were all impressed with central Munich. The pedestrian malls, surrounded by historic buildings were great. Even after dinner, at around 1030 pm, it was hopping. We did some final souvenir/gift shopping and headed to a beer hall recommended by the hotel desk clerk. We had a good dinner. 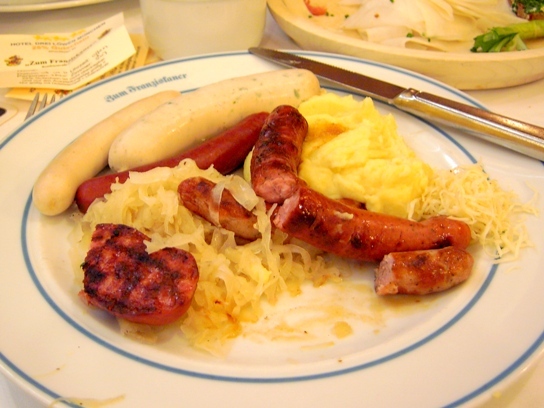 We all had the same thing – a sausage sampler with sauerkraut and mashed potatoes…and of course, beer. We did have a little trouble with Birdie, who insisted in playing with his food and making “food sculptures.” It was sausage; use your imagination. 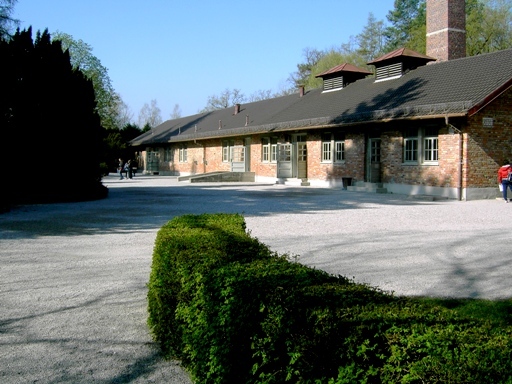 Tomorrow, we are off to Dachau and Berchtesgaden. If God wanted me to speak French, he would have named me Pierre! I have the opportunity to take a great trip later in the spring. More on that later. 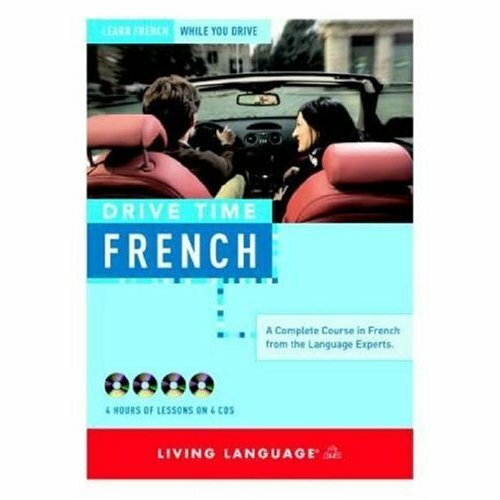 But in the meantime, I am trying to learn a little French. Boy, has that been an experience! 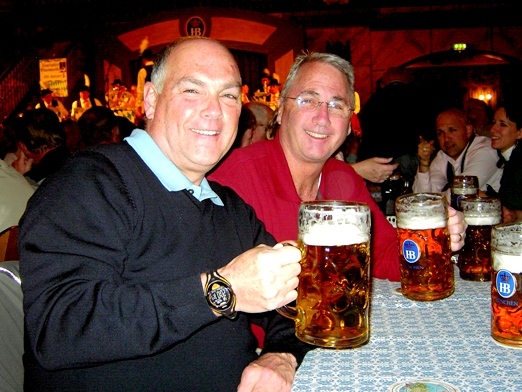 Actually, the one time I had a chance to put that German to use was about 12 years ago when I had the opportunity to travel to Germany with the local Air National Guard unit. (I was acting as a civilian TV news producer and photographer, not a member of the ANG.) That experience demonstrated how useless a language can be if it is just barely learned and then sits unused for 25 or more years. I remembered enough German to know that Strasse means “street.” So I wondered, “who is this ‘Einbahn’ guy who has all these streets named after him?” After awhile, it hit me like one of those stupid-bolts from out of the blue. . 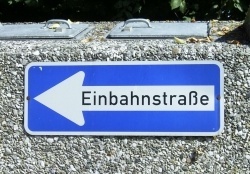 The American translation for Einbahn Strasse is pretty common in this country – “One Way Street.” Duh! So my latest adventure in languages is a learn-while-you-drive CD I borrowed from the local library. I have been listening to the first CD in the set over and over for the past couple of days commuting. It is not going well. First – I am a very visual learner. I have difficulty remembering the vocabulary without seeing it. 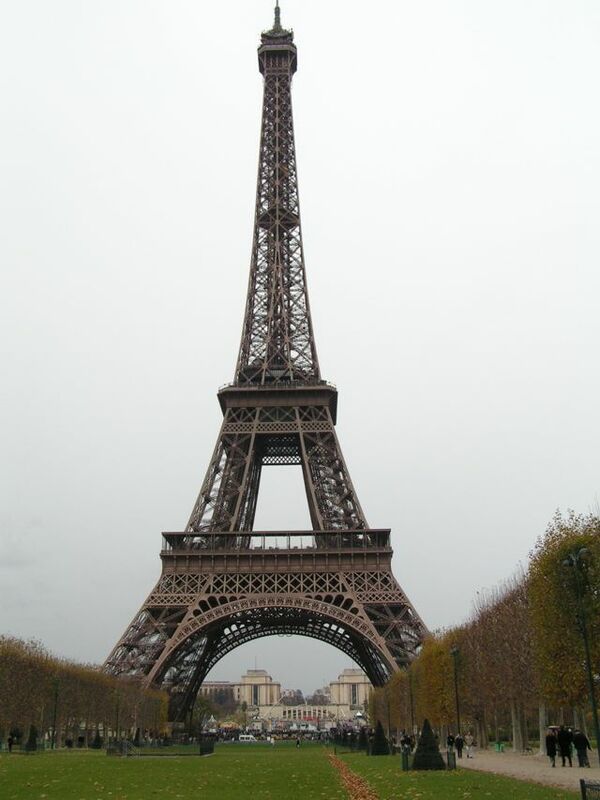 Second – What happened to all the consonants in the French language? I have a hearing deficiency and wear hearing aids. Consonants are my weak area. The French speakers on the CD just compound it. Everything sounds like they are just slurring vowels together. In any case, I’m going to keep at it, at least for a while longer. I don’t need to translate Voltaire; I just hope to be able to ask for directions if necessary. Years ago, I had a friend whose dream was to be a foreign correspondent. (He achieved that by the way.) He always said, his goal was to be able to say “Where to you find the hot babes in this town?” in at least six languages. I don’t think that is on my language CD, and besides, Mrs. Poolman wouldn’t appreciate me practicing that one anyway.